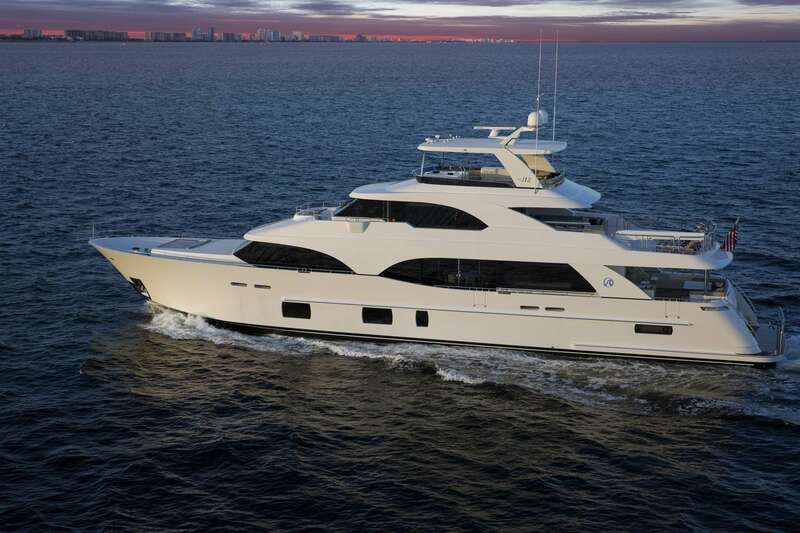 Boasting a crisp interior by Evan K. Marshall and raised to a whole new level this exceptionally voluminous 112 reigns in all angles of natural light, opens interiors in entirely new ways, and reflects a layout that truly considers how guests really use a boat. 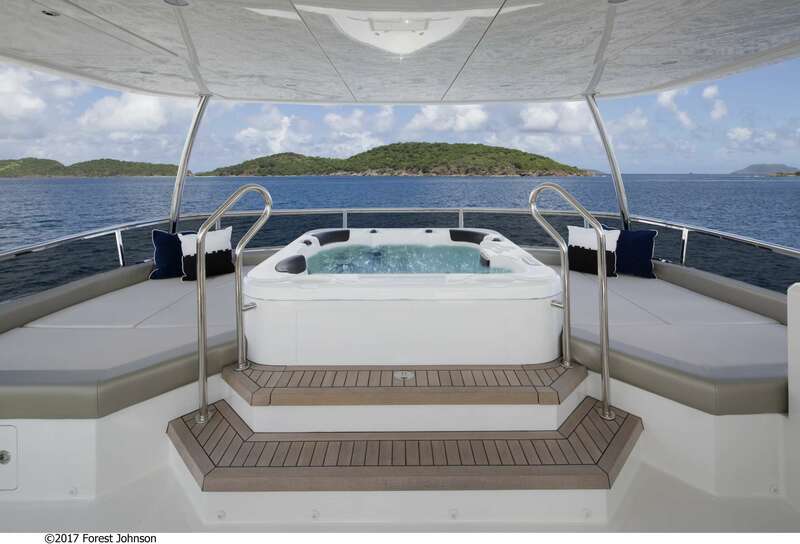 Intimacy, entertaining, family style and relaxation are all encompassed within the tri-deck spaces aboard. There is something for everyone on each level. 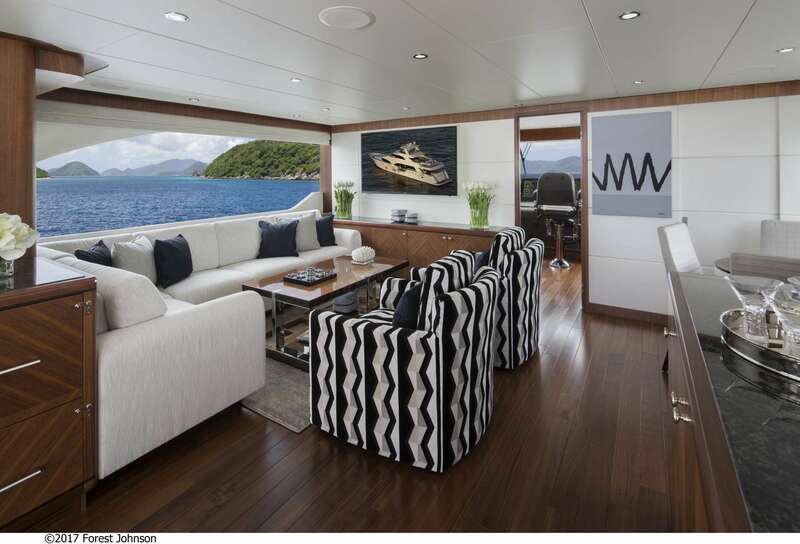 Come aboard via the salon and guests will feel the open and inviting nature of the lounge as well as the adjoining dining. 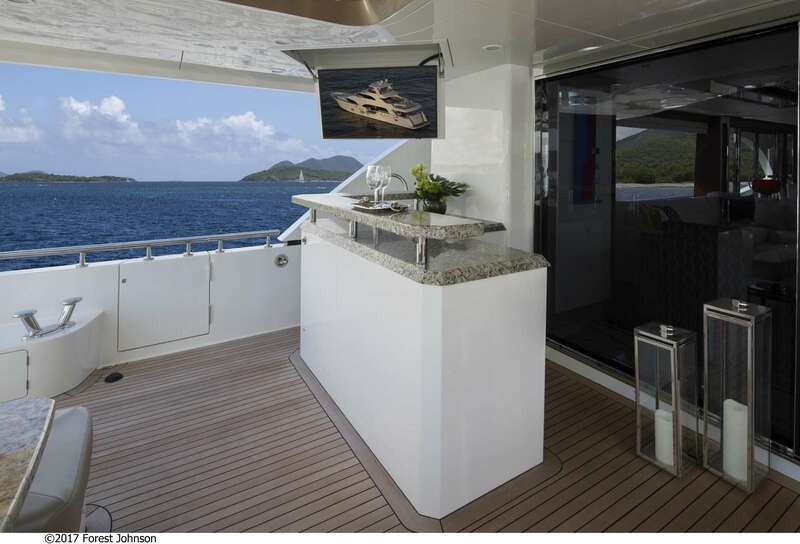 Sliding double doors to port of the dining will even provide an 'indoor-outdoor' feel on a calm day at anchor, yet sheltered from direct sun. 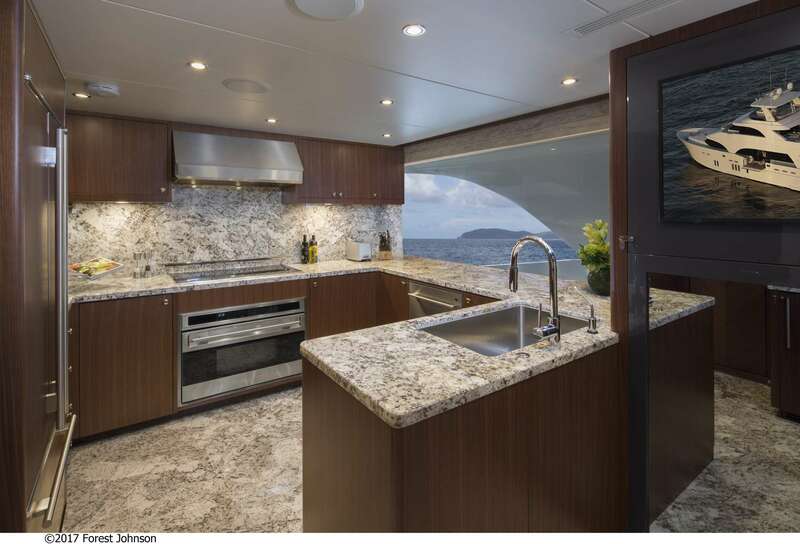 A wet bar with wine refrigeration to starboard allows for ease of service as well. Forward on the main deck is the expansive Master stateroom with panoramic views, extraordinary headroom and an easy access head to port. Further down a flight of stairs is a much larger Master bathoor including individual his and her wardrobe, private toilet, stall shower and stand alone jacuzzi tub to center. This area is truly a Master suite to cherish. 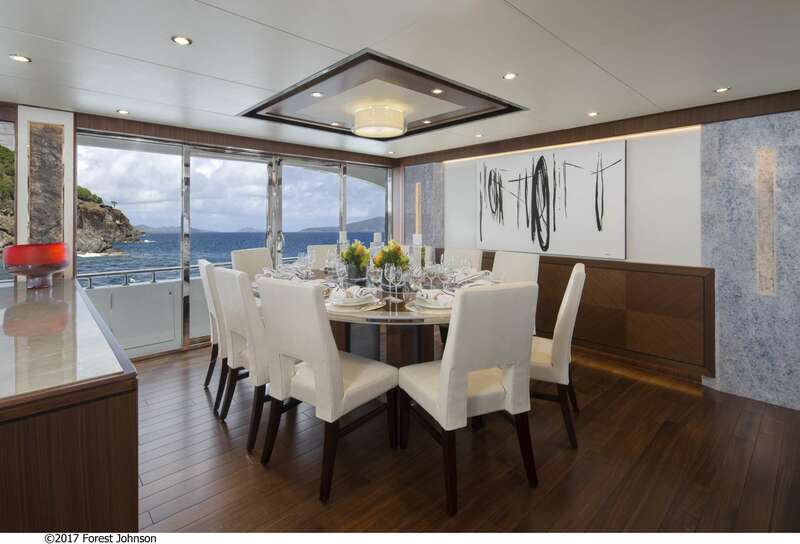 Below deck are 4 additional staterooms. A combination of which can be all double beds or two Queen and two Twin (convertible). All staterooms are en suite with showers and equipped with state of the art AV, iPad controls and individual satellite receivers for TV. Moving up to the skylounge/ bridge deck, there is a equally enjoyable lounge and entertainment area along with a discretely hidden day head on this level. The largest TV aboard is mounted on the wall and perfect for movie nights! Walking aft through the double automatic doors is the notable sundeck. 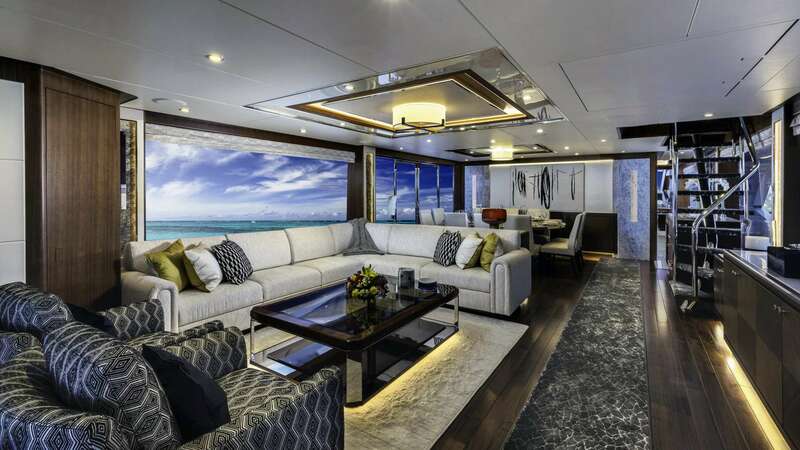 The immediate dining and full bar area is covered by a hard top and further aft of this is a sunning area with chaise lounges and all new teak furniture coming. It also can be partially or wholely shaded with elegant sail shades and permanent stantions in place. Forward of the bridge via portuguese walkaround is a private table and guest seating overlooking the bow and beyond for some of the best views while at anchor or cruising. The third deck is multi-purpose, whether an intimate evening for cocktails with mood lighting overhead and a bubbling jacuzzi dip or for a fun night of dancing and drinks along with a cozy crowd in the jacuzzi. 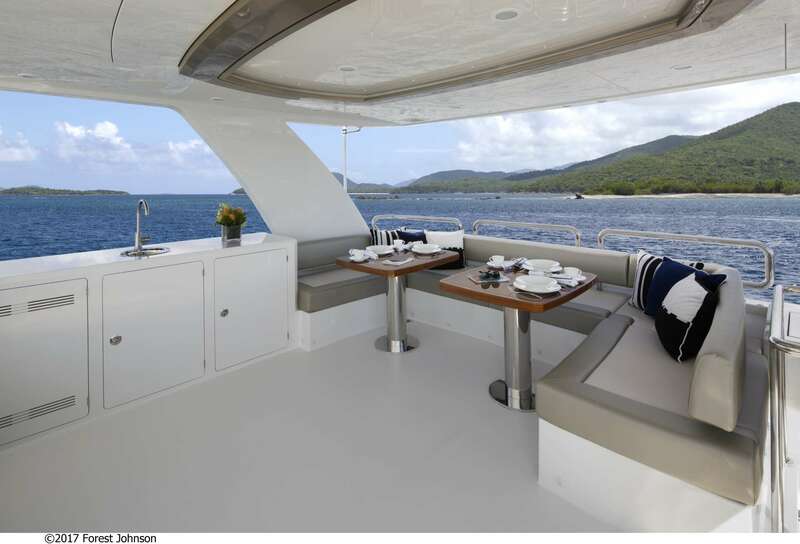 No matter where you are cruising or what level you are kicking back and relaxing aboard SUGARAY, you are bound to walk away wowed by this pristine, spacious and generously appointed cruiser.